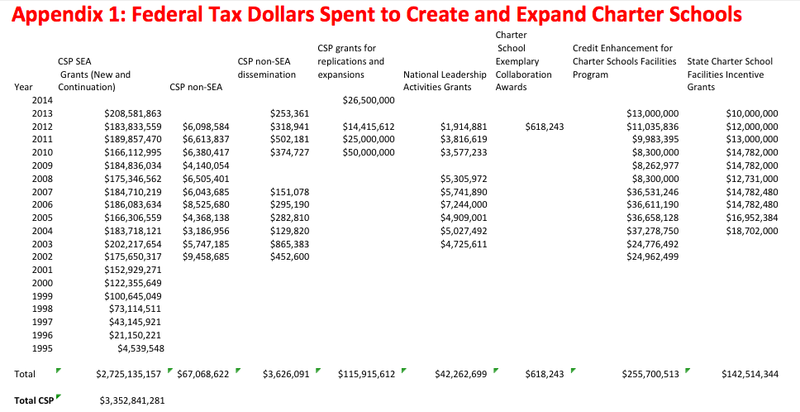 As both the House and the Senate consider separate bills that would reauthorize and expand the quarter-billion-dollar-a-year Charter Schools Program (CSP), the Center for Media and Democracy (CMD) has examined more than a decade of data from the National Center for Education Statistics (NCES) as well as documentation from open records requests. The results are troubling. Between 2001 and 2013, nearly 2,500 charter schools have been forced to shutter, affecting 288,000 American children enrolled in primary and secondary schools. Furthermore, untold millions out of the $3.3 billion expended by the federal government under CSP have been awarded as planning and implementation grants to schools that never opened to students. The failure rate for charter schools is much higher than for traditional public schools. In the 2011-2012 school year, for example, charter school students ran two and half times the risk of having their education disrupted by a school closing and suffering academic setbacks as a result. Dislocated students are less likely to graduate and suffer other harms. Hidden behind the statistics are the social consequences. According to a 2013 paper by Robert Scott and Miguel Saucedo at the University of Illinois. They found that school closures “have exacerbated inter-neighborhood tensions among Chicago youth in recent years” and have been a contributing factor to the high rate of youth incarceration. Because the U.S. Department of Education does not provide the public with any accounting for the amount of taxpayer money—whether state or federal—that has been spent on these failed charter schools, there is no way to estimate the total amount of money missing in action. However, the Center for Popular Democracy (CPD) recently estimated that "according to standard forensic auditing methodologies, the deficiencies in charter oversight throughout the country suggest that federal, state and local government stand to lose more than $1.4 billion in 2015." According to a PowerPoint presentation CMD has uncovered, the watchdogs at the U.S. Department of Education's Office of the Inspector General are currently conducting major nationwide probes into the lack of accountability and oversight within the Charter School Program. One of these audits focuses on where federal grants end up when charter schools are forced to close. A spokesperson for OIG confirmed to CMD that these investigations are ongoing. Meanwhile, U.S. Department of Education officials have assured stakeholders that the problems with millions disappearing down black holes are now a thing of the past. But the fact that the OIG has found reason to launch major investigations this year tells a different story. It is impossible to anticipate the findings of the ongoing OIG probes, but even a cursory review of federal charter school grants in Wisconsin and Indiana, conducted by CMD, uncovered dozens of schools that were created out of seed money under the program but later forced to shutter because of financial mismanagement, failure to educate students or lack of enrollment. Wisconsin received $69.6 million between 2010 and 2015, but out of the charters awarded sub-grants during the first two years of the cycle, one-fifth (16 out of 85) have closed since. Via Charter School was awarded $193,000 in a “planning grant” but never opened. Early Career Academy landed a $193,000 planning grant and was due to open last year. This has been postponed because of “governance issues,” according to the school. The charter is sponsored by a for-profit college—ITT Tech—that is currently being sued by federal government for coercing students into taking out student loans for college credits that do not transfer. “The findings that we are putting forward are pretty stunning…pretty egregious. The waste of taxpayer money—none of us can feel good about,” said Duncan. And yet, he is calling for a 48 percent expansion of the charter schools program—a program that will likely be up for the vote in the House and Senate this week, before the results of any of the OIG audits are made public to lawmakers and stakeholders. CMD will soon be releasing the full dataset, as well as information on the methodology used to arrive at the list of closed schools, to help reporters and public school advocates tell the story. isn't this exactly what we should expect from a large central government program?